No.1098 in the SR Olive Green it carried in the 1930s, seen here after overhaul in September 1994. Back in 1963 the departure of the Cheshams for the Metropolitan Centenary celebrations (and their temporary replacement with more modern corridor vehicles) highlighted the importance of the ongoing search for further high capacity coaches. With "birdcage" sets long gone, eyes had turned to the Ardingly Spur where coaches banished from the Kent Coast and elsewhere awaited their fate. Amongst the sets of Maunsell corridor vehicles stood several steel-clad slab-sided South Eastern & Chatham thirds. 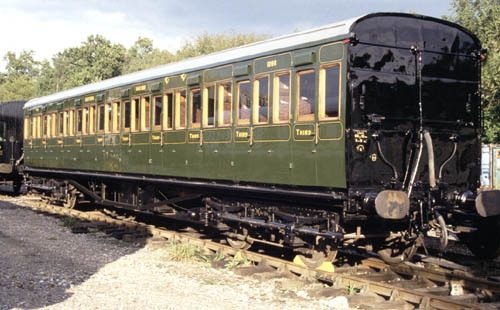 Built in the 1920s for suburban service, both coaches had latterly been "through piped" so that they could strengthen the ubiquitous two-coach push-pull sets at peak times. In this capacity No. 971 had seen service on the Steyning line whilst No. 1098 had long been allocated to the Lymington branch. Arriving by rail in February and May of 1963 their spartan bench-type seating and bare roof-boards in place of ceilings hardly ingratiated them to those with an eye for extravagance. Stigmatised as "characterless" by at least one correspondent, their enduring qualities made them ideal for the regime of minimal maintenance which characterised the Bluebell at that time. The absence of exterior mouldings and compartment inner roofs eliminated two damaging water-traps, whilst massive three-inch thick teak timbers clad in galvanised steel, produced bodies of exceptional strength and durability. The operators too appreciated their high capacity, a "hundred seater" and the Observation Car providing the ideal mid-week train for a small engine to pull. No. 971 saw much use throughout the 1960s, receiving a coat of "Bluebell Blue" in 1966. No. 1098 by contrast was less extensively used and remained in Southern Region Green. A leaking roof ensured relegation to the "second division", at least whilst the Cheshams were available. Re-emerging later that decade, it helped maintain the service during that twilight period when all resources were channelled to the purchase of the line. With the carriage shed a pipe dream, and the margins so tight, some interior painting was undertaken in a locked out compartment whilst the coach was in traffic. No. 971 in malachite green in March 1992. The early 1970s saw both vehicles in the now familiar malachite green livery, matching the newly acquired Bulleid coaches. 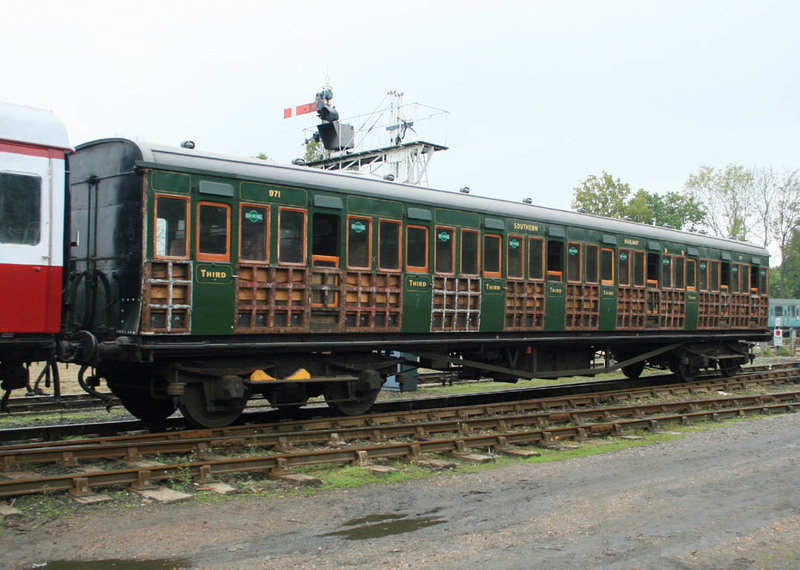 By this time, in common with the fast declining "birdcage" and observation coach, they were the last of the railway's original coaching stock in traffic. With a small engine policy to the fore, the high capacity tradition was continued with three B.R. Standard non-corridor coaches, albeit without the enduring qualities of their wooden bodied predecessors. As late as 1977 the typical mid-week train comprised those three rail-blue liveried "Kings Cross Coaches" and the observation car, strengthened when necessary by one or both of Nos. 1098 and 971. Both coaches received works attention during this period, with No. 1098 sporting the first "operational" Bluebell applied canvass roof - a major landmark for the Carriage & Wagon department. No. 971 was similarly treated in 1979 when, with all windows rebedded, it commenced a further spell of passenger service. The new decade saw both coaches playing a significant role, comfortably outlasting the now decrepit "Kings Cross" vehicles - some thirty years their junior. With Bulleid coaches now forming the core of the fleet, the "hundred seaters" were still invaluable as strengthening vehicles, their screw couplings making them far easier to attach and detach than buckeye fitted coaches. More recently the lack of through lighting control and lavatories (and one suspects less enlightened counsels) has counted against them on the "dead-end" run through Sharpthorne Tunnel. When No.1098 emerges from its current overhaul, replete with through lighting control, it will be good for many years to come, offering an interesting alternative to the corridor vehicles which now predominate. To the writer these workmanlike and enduring coaches are the gems of the collection. They, even more than the "P class" tanks, are the "finest preservation discoveries". Written for the Spring 1994 edition of Bluebell News. © ROGER WILLIAMS. Subsequently, No.1098 has been completed, in the lined Olive Green livery of the Southern Railway of the 1930s, and in 1997 No. 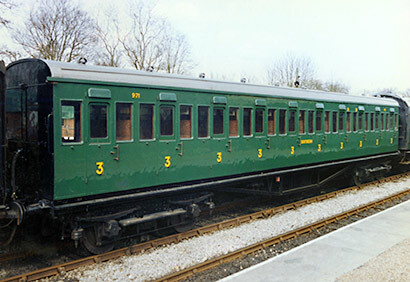 971 was fitted with through lighting control, a new roof canvas, and freshly re-bedded windows with toughened glass, and also repainted in the 1930s' lined olive green, in 1997. 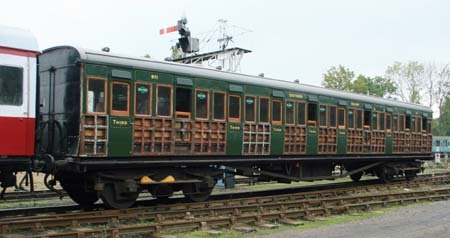 With a change in operational management on the railway, these coaches have, for the past decade, once more been in regular use as a core part of the carriage fleet, operating as part of the "Vintage Branch Line Train" on a growing, and now very substantial, number of days each year. It was apparent that No.971 was clearly due for the sort of attention which 1098 received a decade ago, and the impending completion of the overhaul of the SECR and LSWR brake carriages, expected in 2009/10, would have enabled its withdrawal for a period to allow this work to be undertaken, but in 2007 the coach was withdrawn for what was then said to just be a quick repanelling exercise prior to a repaint. The work required (where the bottom-side had split due to corroded bolts) was of course found to be much more extensive than had been allowed for, and so the carriage has been tarpaulined over and awaits a budget allocation for the work, which would probably also have to include major repairs to the rotten roof and partitions, and re-trimming of the seats. Photographs and further details of this work are available here. Original text by Roger Williams, 1994. Last update 25 March 2009 by Richard Salmon. © Copyright, disclaimer and photo credits.